Offering you a complete choice of products which include recycled motherboard square wall clock, recycled motherboard wall clock, recycled telephone keys square wall clock, recycled tin star wall clock and recycled tin table clock. 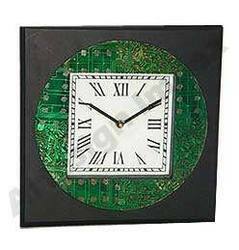 We are one remarkable entity, engaged in offering a wide range of Recycled Motherboard Square Wall Clock. Our offered range is beautifully designed with intricate prints. Our offered clocks are designed attractively in accordance with international norms. Moreover, these clocks find their wide application in various hotels, restaurants, homes and interiors. To enhance the beauty of the walls, our clients can avail these products from us at industry leading prices. 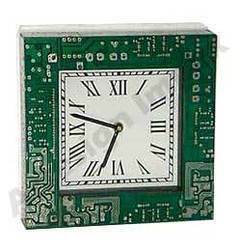 We are engaged in offering a wide range of Recycled Motherboard Wall Clock, which is designed by us using superior quality factor inputs and latest technology. These clocks are available in various dimensions and sizes as per the variegated specifications provided by the clients. In addition to this, the offered clocks are designed with high precision in order to meet the set industry standards. We are one of the accredited offer a premium range of Promotional Wall Clocks. 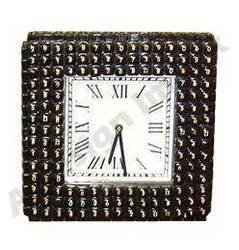 The clocks offered by us designed using optimum quality raw material, which is procured from the reliable vendors. Moreover, the clocks offered by us are known and appreciated for their features like attractive designs and unique patterns. We are instrumental in offering a quality range of Recycled Tin Star Wall Clock. These clocks are designed using optimum quality raw material to remain in tandem with international standards and norms. Owing to their unique style, durability and trendy designs, these clocks are widely demanded in offices, households and more. 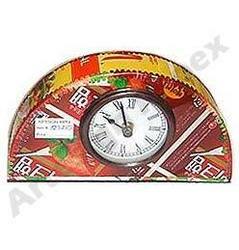 We offer these clocks in different sizes and shapes, which help in meeting the variegated demands of the customers. 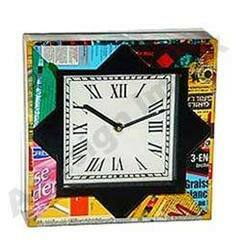 Our organization is known in the industry for catering a distinguished segment of Recycled Tin Table Clock. These decorative boxes are manufactured using superior grade raw material with the help of advanced technology in compliance with set international quality standards. In order to deliver the defect free range, these decorative boxes are tested under the supervision of our experienced professionals on several parameters to ensure the flawlessness deliveries at client's end. Looking for Recycled Clock ?